Anne concentrates her practice on corporate and commercial litigation in the Delaware Court of Chancery. Anne also represents clients in the United States District Court for the District of Delaware and in Delaware Superior Court. Before joining the firm, Anne served as a judicial law clerk to the Honorable M. Jane Brady in Delaware Superior Court and interned for the Honorable Abigail M. LeGrow, Master in Chancery, in the Delaware Court of Chancery. 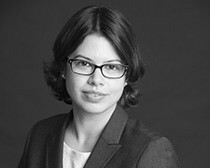 Anne subsequently worked as an associate practicing primarily corporate and bankruptcy litigation at Landis Rath & Cobb LLP.